A huge THANK YOU to everyone who has come to the new Irvington space, expressed interest and offered support. 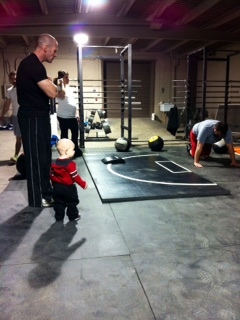 We’ve had close to 50 people come in to work out during our FREE PREVIEW sessions. And you all did a great job!! The next preview workout opportunity will be this Sunday at 9am (still a few spots -contact us if interested). We will post dates/times for next week soon. ICF will not be open today or Saturday as we head to Terre Haute to cheer on our own Jeff and Ryan as they compete in the CrossFit Winter Challenge– Good luck Jeff and Ryan!! Remember to tell your friends and neighbors, “like” us on facebook, post on our page and let us know if you have questions or want to know more. When we hit our next milestone we might have some goodies !